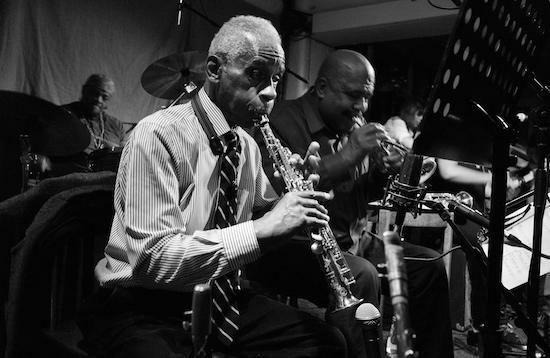 Roscoe Mitchell, Famoudou Don Moye and co explore possibilities, celebrate collaboration, create ferocity, blow minds. Living in close proximity to Cafe Oto for the past nine years has been a horizon-expanding, genre boundary-obliterating experience that has yielded many mind-blowing musical evenings, from the perennially returning Sun Ra Arkestra to the Joe McPhee, Colin Stetson, Linda Sharrock, William Parker, Hamid Drake and Charles Gayle, to name but a few. Until this residency though, I had remained an Art Ensemble of Chicago neophyte. With the AEC approaching their 50th anniversary in 2019 and the only original members being saxophonist Mitchell and ‘sun percussionist’ Famoudou Don Moye, I wasn’t sure of what to expect. Before the band play the first note on the first night, it’s obvious that this will be a far cry from seeing a rock heritage act like the Rolling Stones. At 77, Mitchell has a few years on both Jagger and Richards, but seeing him play and hearing him talk about his work and music in general makes age appear irrelevant. Approach and attitude are everything. Both Mitchell and Moye are eager to stress their dual roles as teachers and students, and the improvisational nature of their music, taking in multiple forms existing outside of the term ‘jazz,’ constantly refined in the furness of the moment, onstage before audiences all over the world, is the absolute antithesis of replaying old hits for nostalgia-craving fans. Born out of the Association for the Advancement of Creative Musicians, a Chicago collective founded in 1965 by Muhal Richard Abrams, Phil Cohran, Jodie Christian and Steve McCall, the AEC are the living embodiment of the AACM’s nurturing and socially cohesive ethos. As Mitchell said during the Q&A before the last night of the residency: “I tell people today now, don’t let anybody define you. You look at what you want to do and if it’s not happening then you should go about finding a way to do it, because you would be surprised at how many people would help you if you present a good idea to them. We carried the AACM banner then, and we carry it with us now.” The inherent strength of this social and creative model, as Paul Steinbeck points out in his introduction to his AEC biography, A Message To Our Folks, has meant that the AEC has been able to weather difficult times, and even the deaths of several key members. The presence of such highly talented second-generation members as Tomeka Reid and Matana Roberts is yet further testament to the AACMs continuing relevance and importance. The quartet of Mitchell, Moye, Hugh Ragin and Junius Paul opens the first night in traditional AEC mode, standing in silence looking to the left of the stage, as if to mark a subtle break from the everyday rituals that take hold of us all and invite the audience into a healing ceremonial space of their own making. A gorgeous soft tone generated between Mitchell and Ragin on saxophone and trumpet slowly fills the room, lapping against the walls with Moye’s delicate cymbal work and Paul’s bowed bass further sustaining its sonority. Much of the set seems based on the sympathetic resonance generated between pairs of instruments, and even as the intensity of the sculpted sound increases to white-hot levels by the end of the performance, with Mitchell’s circular breathing powering an unstoppable squall of shrill sound waves from the diminutive sopranino sax, there is a supreme level of control between players. It rebuts the oft-held misconception concerning ‘free’ music, that it is a lawless activity which largely produces self-indulgent music. As Mitchell takes pains to elaborate during the Q&A: “What I would say to people who want to become good improvisers, is that they need to study composition and improvisation as a parallel. Because what it is, on a higher level, is... a game for people who can think, and actually create composition in real time.” George Lewis makes exactly this point in his detailed history of the AACM, A Power Stronger Than Itself, paraphrasing the anthropologist John Szwed, who argues that: “The esthetics of jazz demand that a musician play with complete originality, with an assertion of his own musical individuality... At the same time jazz requires that musicians be able to merge their unique voices in the totalizing, collective improvisations of polyphony and heterophony.” As Lewis also rightly concludes: “The implications of this esthetic are profound and more than vaguely threatening, for no political system has yet been devised with social principles which reward maximum individualism within the framework of spontaneous egalitarian interaction.” The need to create such an experimental zone, whereby black musicians who were denied a self-determining territory of their own could work through the implications of an artistic model that could prefigure a future social model, was obviously a driving imperative. Just as Sun Ra argued that space was the place where the black race could truly be free, that space was available in the present in the form of free but disciplined use of the space between musical notes and silence itself. This kind of artistry doesn’t come easily, and musicians who attempt such feats without aspiring to the AEC work ethic of regular 9-5 practice perhaps account for the popular fallacy about ‘free jazz’ being unrestrained chaos. The music isn’t entirely improvised either - sheet music rests on stands in front of each of the players, among their pages are ‘Tutankhamun’ and ‘Hail Now We Sing Joy.’ It’s difficult to tell where written music ends and the improvisation begins, though, and one gets the sense that the musical scores are there for reference when needed, to be played partially or even inferred as the occasion demands. The second night ups the ante of the collaborative nature of AEC still further by adding cellist Tomeka Reid, double bassist Silvia Bolognesi and violinist and vocalist Mazz Swift to the mix. The additional players (who also form the band Here In Now) are each brilliant in their own right, and fit perfectly into the expanded group sound. Indeed, such a seamless melding of the younger and older players offers a fantastic example of the AACM ethos in action. The increased possibilities for creation out of chaos inherent in this larger grouping really suits the AEC, and the news that the 50th anniversary tour scheduled for 2019 will feature a further expanded version of this group with the addition of a third double bassist, two extra horns in Fred Berry and Nicole Mitchell and an African percussionist, further stokes anticipation of that event. The energy levels on this second night are astounding, and even more so on the third and final night of the residency. Mitchell intones a simple phrase, “Silence is golden,’ before embarking on a terrifyingly fierce trilling passage on the sopranino sax that does disorienting things to my ears that they’ve never had done to them before, and hopefully won’t have done to them again anytime soon. When he stops abruptly, the ensuing silence is like a punch to the face. In the Q&A, Mitchell had exhibited the demeanour of a no-nonsense educator of the highest order, here he takes on the role of a playful zen master, striking the audience with sound rather than the traditional buddhist keisaku stick.